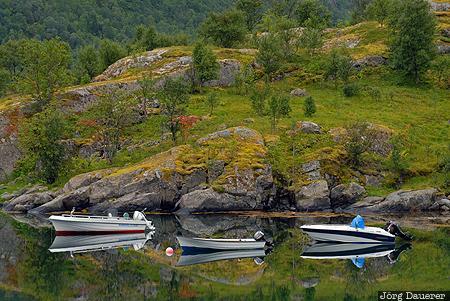 Reflexions of moss covered rocks and three small boats in the calm waters of Sløverfjorden in the east of Austvågøy. Austvågøy is an island of the Lofoten archipelago north of the arctic circle in Nordland, Norway. This photo was taken in the early afternoon on a cloudy day in August of 2010. This photo was taken with a digital camera.